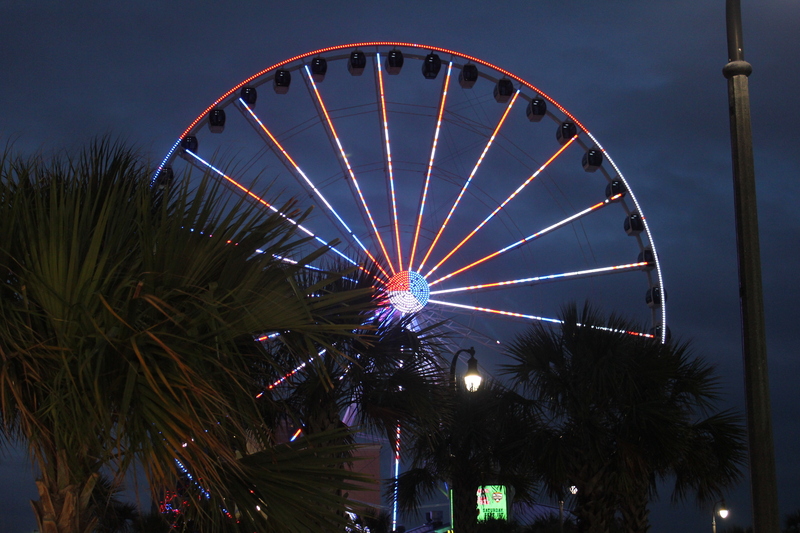 During the week of August 20th, Amanda & I enjoyed a vacation in North Myrtle Beach, South Carolina. My parents, sisters, brother-in-law, niece, nephew & his girlfriend, enjoyed a wonderful, relaxing time at Crescent Shores. Amanda & I flew down from NJ to Charleston, driving 2 hours north to NMB. Growing up in NC, going to Myrtle Beach was always the special trip I looked forward to each summer. It was a 5 hour drive from our home, and I always went with my cousin Chris. We always had fun swimming in the pool & ocean, and hanging out at the Pavilion amusement park. The last time I had visited MB was in 1997. Amanda had never been to MB, but had heard stories about it growing up in upstate NY. In the 8 years she lived in NC with me, we never went to MB (we had gone to the beaches in NC), so this was her first time going. Amazing to me how much MB has changed since ’97. Gone is the Pavilion, the hotels have been given facelifts, and it seems smaller than I remember. But, what remains are memories of my youth, of high school graduation, and going to the beach with friends. Memories of calabash seafood, and nights playing putt-putt. Fond memories of youth replaced by new memories of family being at the beach. The best part of the trip was being able to spend a week with family. No worries from work, no rushing around….just enjoying each others’ company. Now the realities of going back to work set back in, but I only need to close my eyes to see the sunrise over the beach. Life is good! Previous: Previous post: BWI – Baltimore Airport Is My Least Favorite EVER & Here’s Why? Myrtle Beach looks beautiful! It must have been an incredible experience to walk along the beach with that beautiful sunset behind you. Thank you for sharing!